Objective: Create a new standardization of field preparation for interventional pain procedures that decreases surgical site infection. Results: Procedural site infections can result in significant morbidity and mortality for patients and increased costs for management of infection. In the pain management field we perform numerous interventional procedures daily, and there is potential for infection if skin sterilization and preparation are inadequate. This performance improvement project was designed to suggest a standard for pre-procedural sterile preparation that decreases risk of surgical site infection. 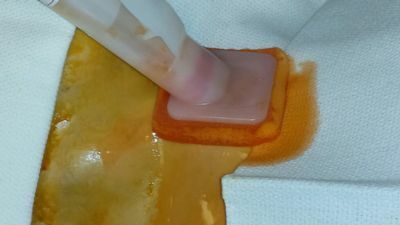 Traditionally, we have performed skin preparation for interventional procedures using betadine-soaked sponges in triplicate, followed by a sterile drape. With this technique we had three incidences of infection at the injection site that occurred 2-3 days after the procedure. We then decided to incorporate betadine and Chloraprep (chlorhexidine gluconate 2% and isopropyl alcohol 70%) into our routine skin preparation prior to interventional pain management procedures. 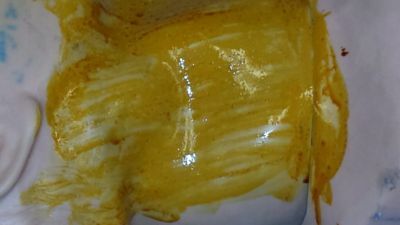 We first tried this by using Chloraprep, followed by betadine prep in triplicate; however, we noticed a precipitant formed on the skin. When starting with betadine for skin sterilization followed by Chloraprep, no precipitant formed. 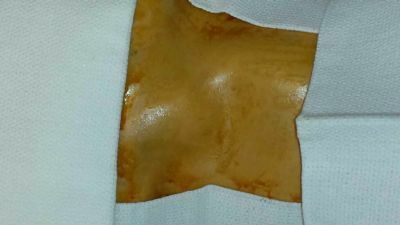 Our plan was to triple prep with betadine, followed by a drying towel, subsequently followed by Chloraprep, during which time the skin was prepared from inner to outer fields, and the edges of towel were saturated with Chloraprep. 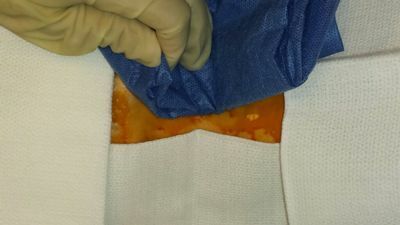 The towels were then held in place with a larger drape and the procedure was performed. Tthe patientsin which we incorporated the triple betadine preparation followed by Chloraprep had no negative outcomes, including infection at procedural site, skin irritation, skin breakdown, or precipitant formation. Review: Chlorhexidine is bactericidal and bacteriostatic for Gram positive and negative agents, and povidone-iodine is bactericidal with antifungal and antiviral properties; it is suggested that the two agents may work synergistically 3. In a study by Guzel et al., skin cultures were taken from neurosurgical patients wherein skin preparation was done with chlorhexidine for three minutes, followed by two preparations with betadine for 30 seconds each. There was no culture growth after double preparation, but there was culture growth after only chlorhexidine prep (18% of cranial surgical patients; 10% of neurosurgical spine patients)2. In a study by Anderson, MJ et al, chlorhexidine and povidone-iodine, combined and singular, were evaluated against six common nosocomial agents, with results reflecting a benefit when both agents were combined 1. Finally, an editorial by Mashhadi S et al. 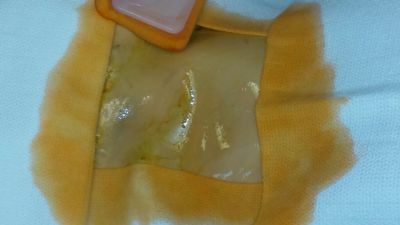 describes how double preparation, first by povidone-iodine, then wipe with sterile gauze, followed by chlorhexidine, has been adopted for plastic surgery without adverse effect3. 2. Guzel A, et al. Evaluation of the skin flora after chlorhexidine and povidone-iodine preparation in neurosurgical practice. Surg Neurol. 2009 Feb;71(2):207-10. 3. Mashhadi SA et al. Combination of chlorhexidine gluconate and PVP in surgical site antisepsis. J Wound Care. 2012 Mar 2(3):141.